Surprisingly, this is the only book that I got for Christmas, and I picked it myself out of the extremely colourful graphic novels shelf in Waterstone's. I have a whole shelf on my bookcase in my room that is all graphic novels, and I usually only read the ones that are important to the DCU timeline (before the reboot) or ones that have been recommended. I'd never heard of Lee Bermejo before reading this book, but his art style looks like it's going to be incredibly realistic, which I'm not fond of at all. Oh, and look! Catwoman's on the back.... Oh joy. I'm very confused as to what to think of this book. 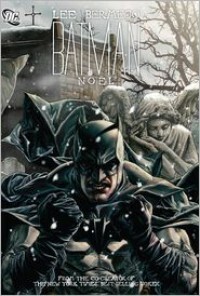 It's basically A Christmas Carol but with Batman characters, and that doesn't seem original to me at all. A Christmas Carol is a cow that gets milked by the media every Christmas and I had been hoping for years that DC Comics wouldn't jump on that bandwagon. Despite that, I did find it interesting how the characters where placed in the roles of Dickens' characters. Obviously, Batman was Scrooge and a new character called Bob who gives the Joker money in order to sort out his work live was, well, Bob Cratchit. I thought it was interesting how Jason Todd was Jacob Marley, even though he doesn't actually appear as a ghost and speak to Batman (who doesn't believe in ghosts). Catwoman (urgh) was the Ghost of Christmas Past, which was actually a good choise because she reflected the changes that Batman and herself have gone through and the times that have passed. Superman was the Ghost of Christmas Present. At first, I didn't understand how that would work, but it did work effectively because he has the power to show you what is going on in the world in a space of about two minutes. He also glowed like the Ghost from the Patrick Stewart film. Nice touch. And finally, the Joker was the Ghost of Chrstmas Yet to Come. I didn't really understand how he was since all he did was drag Batman into an open grave and shovel a crap-ton of soil onto him. Without saying anything. Odd. I wasn't too keen on the art as it is in the realistic style that I cannot stand appearing in comics. I would've preferred the art to be in a cartoon-like style like Jim Lee's style or Tony Daniel's style. It would've looked more like a comic to me. I'm a bit on the fence with this book. The art style wasn't my cup of tea, but the way A Christmas Carol was varied was enjoyable. I managed to read this book in one night, so it makes for a good bedtime read, particularly because it has a happy ending. As I said, I would've prefered a different art style, but the book is written very well.